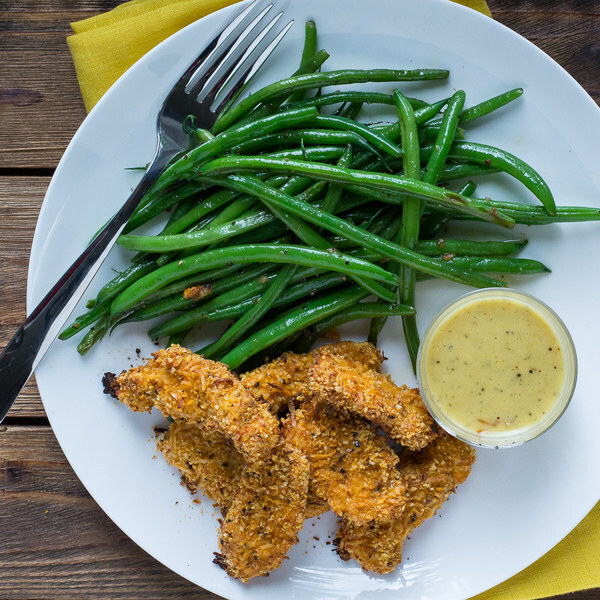 ← Chicken Tenders with Honey Mustard Dip & Roasted Green Beans. Preheat the oven to 425°F and position rack in the centre. Line a baking sheet with parchment paper. In a medium bowl, mix together the almond meal, shredded coconut, garlic powder, paprika, salt, and pepper. Dip the chicken strips into the egg, then transfer to the dry mixture and turn to coat. Shake off excess and place on the baking sheet. Drizzle with olive oil. Place in the oven and bake until the crust is golden brown and the chicken is cooked through, 15-20 minutes. Wash the green beans and trim ends. Add to the boiling water and cook until bright green, 3-4 minutes. Drain in a colander and rinse under cold water to prevent further cooking. Set aside to drain further. In small bowl, prepare the dip by whisking together ⅓ of the minced garlic (save the rest for the green beans), mayonnaise, Dijon, honey, salt, and pepper. Wipe the saucepan dry and return to the stove over medium heat. Add oil and swirl to coat bottom. Add the remaining minced garlic and cook until fragrant,15-30 seconds. Add the green beans and season with salt and pepper; toss to combine. Place the chicken tenders on a plate, arrange the green beans on the side, and serve with the honey mustard dip. Enjoy!